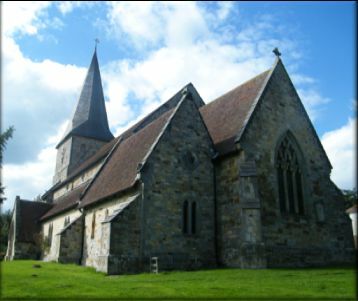 All the information about services, how we worship, activities and contacts can be found in other sections of this website as All Saints' is part of the Heathfield Benefice. Find out more about the church using the links below. Further information will be added to each area with a more extensive history section being developed and some photos of life in the church today coming soon. All Saints Church was built in the 14th Century and is a Grade II* listed building. There are nine unique stained glass windows, a spire which can been seen across the Heathfield landscape, a Bell Tower, and Churchyard full of history and registered with the War Graves Commission. There is a linked and very active fundraising charity associated with the Church called FASCOH - 'Friends of All Saints' Church Old Heathfield'.